The facility is located in room 0216 on the ground floor of the Materials Science Addition (MSA), which is connected to the Chemistry Building. The MSA is located along Perth Drive, in the northeast of the campus. An overview of the campus can be found by clicking the image on the right. 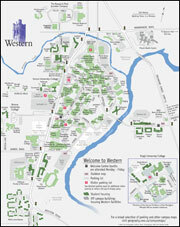 A complete series of campus maps is also available. Use the google map insert on the left to determine driving directions to the east entrance of the chemistry building, which permits access to the NMR facility. The nearest public parking can be found at the University Hospital parking garage, which is just north of the chemistry building. Parking is $12.50/day. If you park at this parking garage, you will access the NMR facility from the east entrance (see below). 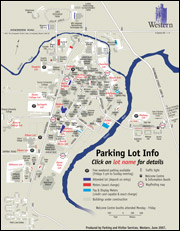 An overview of the visitor parking at Western can be found by clicking the image on the right. The NMR facility can only be accessed via the chemistry building. The chemistry building has two entrances, a west entrance near the Taylor Natural Science Library and an east entrance located along Perth Drive. You will enter on the basement floor. Walk straight, the hallway will eventually veer right and the elevator will be on your left. Go up to the ground floor. Turn left as you exit the elevator, and follow the hallway around the corner. Take the first left, which leads into the MSA. Proceed through the double-doors and the NMR facility is on the left-hand side. You will enter on the first floor. Go down the stairs or take the elevator down one level to the ground floor. As you exit the stairwell or the elevator, go straight through the double-doors into the chemistry building. Take the first right, which leads into the MSA.